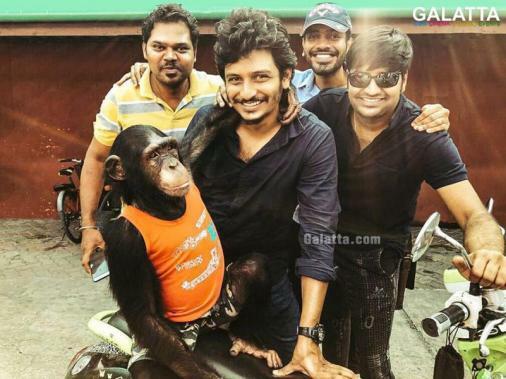 Ever since it was announced that a gorilla would be featured as a major character in Jiiva’s upcoming film, Gorilla, fans have been quite excited. Directed by Don Sandy under the All In Pictures banner with music by Sam CS, Gorilla is said to be a heist thriller with Shalini Pandey as the female lead alongside Yogi Babu, Vivek Prasanna, Sathish, 'Motta' Rajendran, Radha Ravi in vital supporting roles and is expected to hit screens in the coming months. In the meantime, Gorilla has seen its first big advancement in its trade with the film’s Tamil Nadu distribution rights being acquired by Seven Screen Studio. The film has already generated quite a lot of curiosity among fans after official stills as well as those from the shooting spot had come out.